I've been subscribing to Stitch magazine since the first issue and I don't think I've ever made anything from it, although I love looking through every issue and dream of trying out the various designs and techniques. 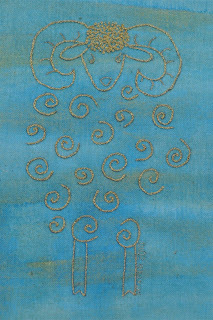 After finishing one piece of embroidery and deciding that my hands were recovered and I could once again do embroidery, I looked around for another project and found this design in the Stitch magazine, which I had long wanted to do. I painted the background using Lumiere Halo Blue-gold. The original design was goldwork but I deiced to do it in chain stitch instead, with french knots for the topknot, using a gold thread. I don't know what I'm going to do with this piece either but I'm sure it'll find a home eventually. I'm really enjoying once again being able to do embroidery and other hand work. He is lovely Monica. I agree with you that it is a great magazine.